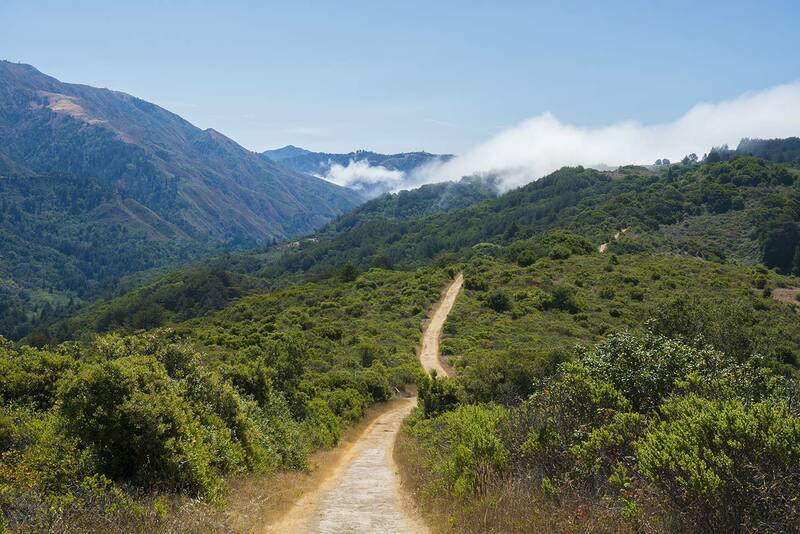 Molera’s most enjoyable loop hike climbs a partially-wooded ridge, offering some nice views of the Big Sur Valley. 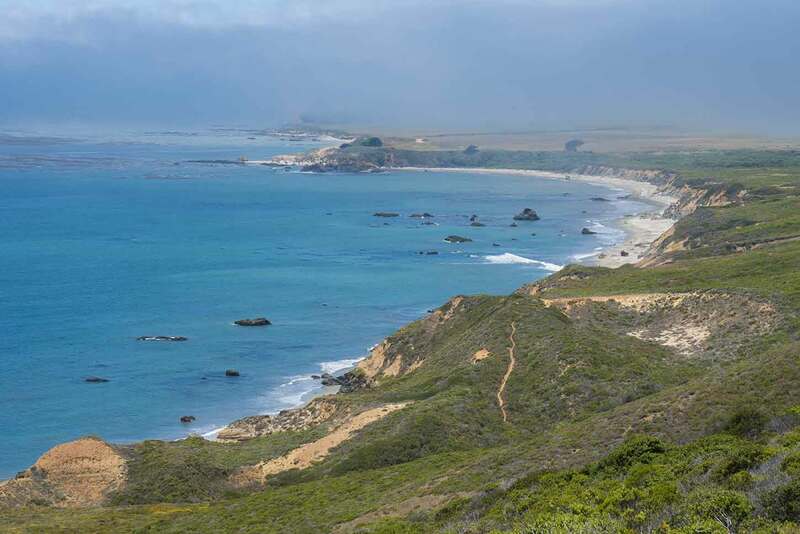 The trail then descends through coastal scrub, offering sweeping coastal views before running along seaside bluffs and reaching two beaches. 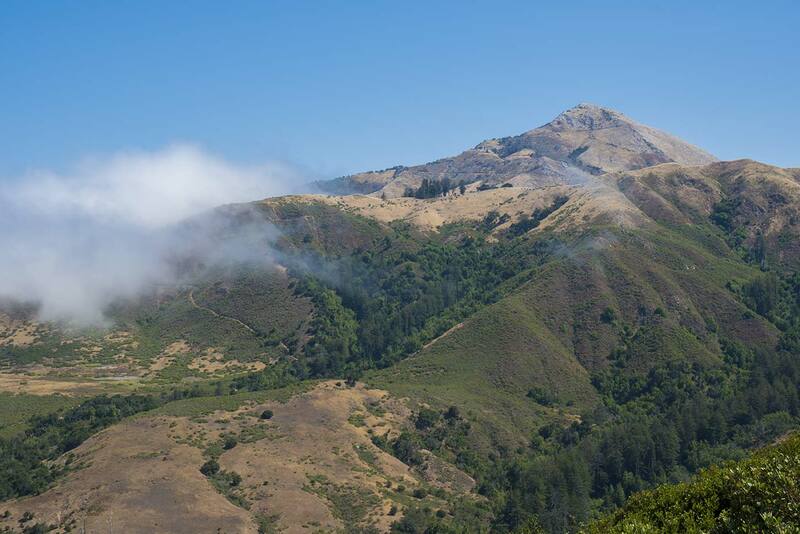 This is a popular loop and gradients are reasonable throughout, but the Hidden and Panorama trails are usually overgrown, with an occasional sprig of poison oak hiding among all the other plants. 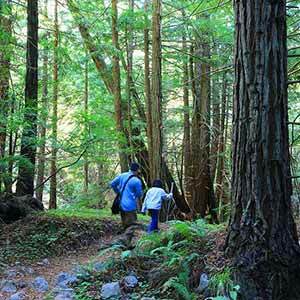 Wear heavyweight pants (like jeans) to protect against the poison oak. Thanks to a little shelter from the northerly winds provided by Point Sur, this trail is often sunny when the rest of Big Sur is fogged in. 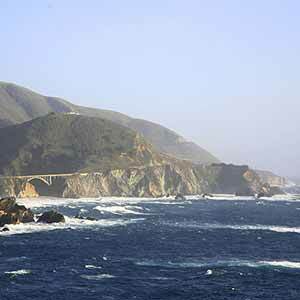 In wintertime, there are no bridges across the Big Sur River and the loop may be inaccessible. From the parking lot, walk just outside the entrance kiosk and turn right onto the wide dirt road. Turn right at the first trail intersection onto the Creamery Meadow Trail and cross the narrow seasonal footbridge (really just a few planks) across the Big Sur River. Continue on the wide, flat trail, which is unremarkable but is the park’s busiest trail, since it’s now the only route to the beach. Turn left onto the Ridge Trail, the first trail to your left that goes uphill. 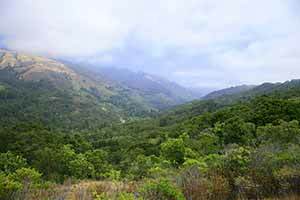 The trail climbs through open coastal scrub high above the green and densely-wooded Big Sur Valley. 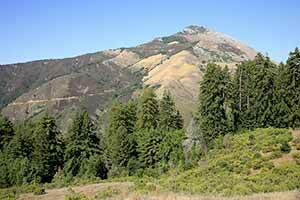 To your left are some nice views of a big scrub-covered ridge with redwood-filled gullies. 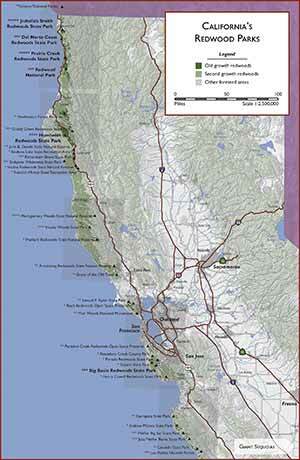 Traffic noise drifts up from Highway 1. 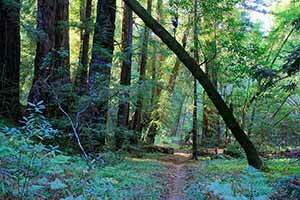 The trail eventually enters an oak grove, then, continuing its incessant climb, passes through a small redwood grove. The remarkably cool, deep shade of the redwoods seems out of place after all the open scrub. The grove doesn’t really look like old growth, but there aren’t any signs of logging and few trees are pretty good-sized for Big Sur, most notably a 6-foot-diameter one at the end of the grove. 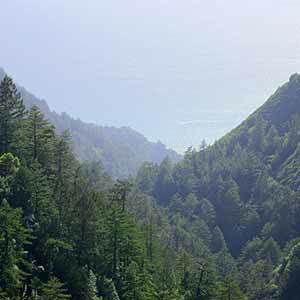 The trail soon leaves the redwoods and breaks out into the sunshine, offering views of the ocean. At the highest point in the loop is a bench under a large tree. If the bench isn’t occupied, this is an ideal place for lunch. 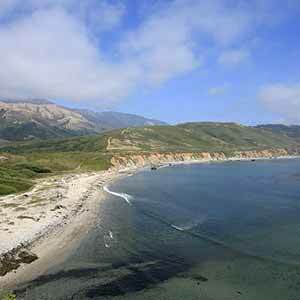 The bench has a dramatic view north of coastal ranchland and Point Sur. Although it’s only at an altitude of 1000 feet it feels much higher because the landscape is so low and flat. To the east, the rocky peak of Pico Blanco rises above the other mountains like a mini-Matterhorn. From the bench, the Panorama Trail begins a steep descent, at first running alongside a dirt driveway. A short spur leads to perhaps the best viewpoint of the entire hike, with coastal views to the north and south, although the views to the south are somewhat spoiled by a housing development. 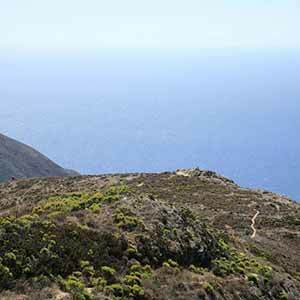 The trail descends steeply through dense coastal scrub that sometimes forms high walls on both sides of the trail. Wildflowers cover the landscape in spring and early summer. This part of the trail is always at leaset a little brushy, and little sprigs of poison oak lurk among the scrub. 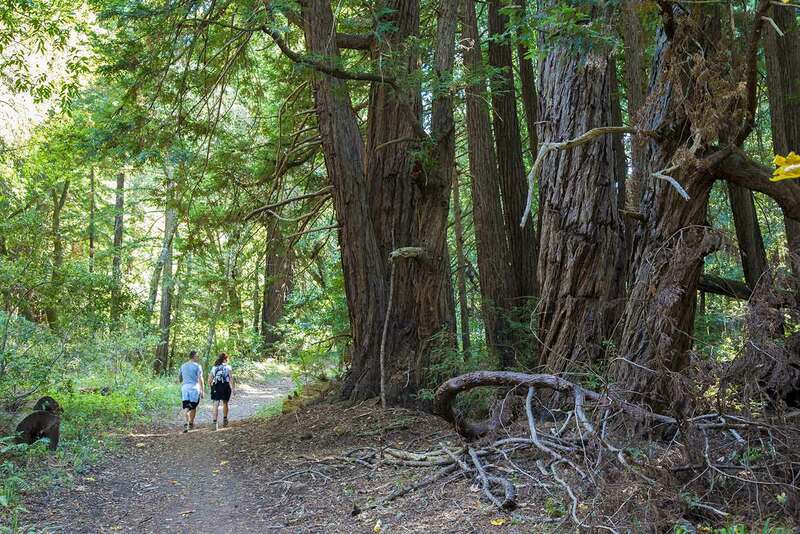 At one point, an unofficial side trail leads into what appears to be a thicket of shrubs but turns out to be a dense grove of really tiny redwood trees. The trail bottoms out in a gully, then climbs slightly to an intersection with the Spring Trail. This trail descends through the same gully to a small clean beach sheltered by bluffs, although to get to the beach you’ll have to scramble over a huge pile of rounded-off logs. 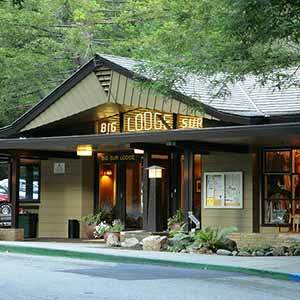 This beach is the nicest in the park and is a popular destination, even though it’s a long walk from the parking lot. After passing the side trail to the beach, the main trail becomes much wider and is no longer overgrown. 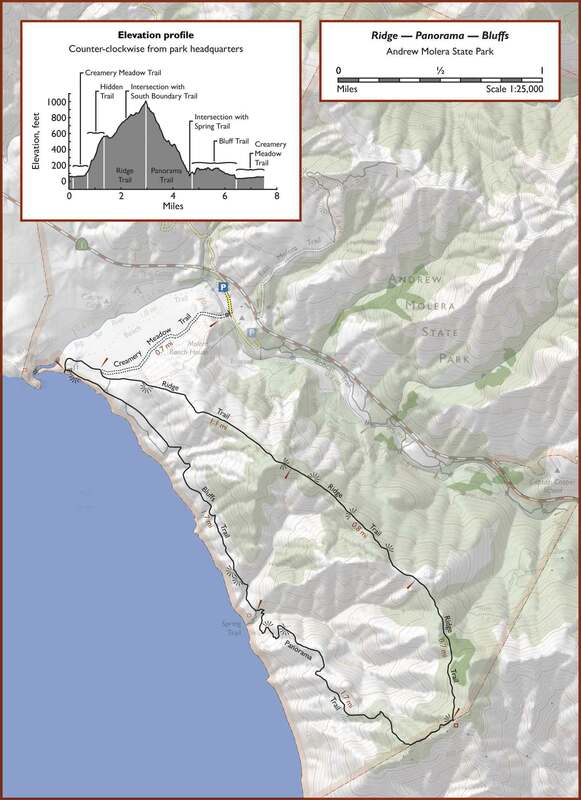 Now named the Bluffs Trail, it undulates along the coastline before flattening out. This is the easiest part of the hike but it’s a little dull; it’s pretty far from the bluff so it doesn’t offer any really great ocean views. Follow the trail back to the Ridge Trail and turn left. Turn left again onto the wide Creamery Meadow Trail to reach the beach. There are a lot more stones and driftwood at this beach, and the site is more open and windy than the little cove on the Spring Trail. Even so, on a nice day it’s a pretty scenic beach. Return on the Creamery Meadow Trail. 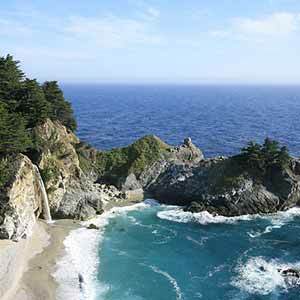 Check out the Hiking in Big Sur website for a description of a similar hike together with some great pictures.